Man City will be keen to bounce back from their disappointing Champions League exit when they travel to Wembley to face Tottenham on Saturday night. Will the Citizens back to winning ways? This article contains our Spurs vs Manchester City betting preview with predictions, betting tips, lineups, team news, best odds, exclusive offers and no deposit free bets to use on the match! 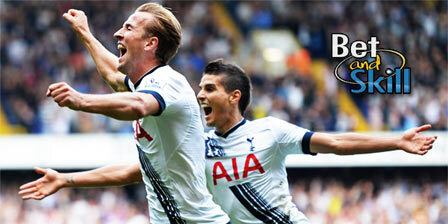 Get 25/1 Manchester City to win vs Tottenham with Paddy Power! Customers can get Man City at an enhanced 25/1 to beat Spurs. Max Stake £1. Winnings paid in free bets, valid for 7 days, only deposits with cards/Paypal count. Exchange and multiple bets excluded. T&C’s Apply. 18+|Gamble Aware. Man City suffered a 1-2 loss to Liverpool on Tuesday and dropped out of the Champions League. That was their third consecutive defeat as Pep Guardiola's men suffered a 3-0 defeat in the first leg match at Anfield Road and lost 3-2 at home the Manchester Derby against United. They still boast a 13-point gap at the top of the Premier League table and should have no problems to secure the domestic title. The Citizens ran out emphatic 4-1 winners in December's reverse encounter. They boast the best attack of the league with a whopping 90 goals scored in 32 games so far (and a +66 goal difference). Anyway, their defense have concede 8 goals in the last 3 matches in all competitions. Sergio Aguero will miss the trip to Spurs due to a knee injury, meaning that Gabriel Jesus will lead the line. Leroy Sanè and Raheem Sterling are favorutie to flank the Brazilian striker in attack, with Bernardo Silva offering a worthy alternative. Fernandinho is suspended and will be replaced by Ilkay Gundogan in the middle of the park, where Kevin De Bruyne and David Silva should retain their starting berth. Perp Guardiola will be expected to revert back to his favoured 4-3-3 system after experimenting with a three-man defence against Liverpool. John Stones is struggling with a groin issue, so the likes of Kyle Walker, Vincent Kompany, Nicolas Otamendi and Fabian Delph should form the backline. Benjamin Mendy remains injured. Tottenham are unbeaten in 14 Premier League fixtures, with their 2-1 win at Stoke last time out making it four wins in a row in all competitions and six in Premier League. Since all the last 4 games were played away from home, Saturday’s outing will be their first in front of the home support since that 2-1 defeat to Juventus in early March. They have lost only one Premier League match at Wembley Stadium this season and currently sit 3rd in the Premier League standings, level on points with Liverpool but with a game in hand. As to direct encounters, Mauricio Pochettino's men have won three of their last five meetings with Manchester City, losing only once. Mauricio Pochettino has revealed that Danny Rose will miss the home meeting with Manchester City due to a calf complaint. The Argentine manager is unlikely to make wholesale changes to his XI. Ben Davies is expected to come in while Serge Aurier could keep his place at right-back. Eric Dier should partner Mousa Dembele at the base of midfield in the usual 4-2-3-1 formation, with Victor Wanyama dropping to the bench. No changes are expected in attack where Dele Alli, Christian Eriksen and Son Heung Min will support the lone striker Harry Kane. Get 25/1 Manchester City to win vs Tottenham with Betfair! New Customers can get Man City at an enhanced 25/1 to beat Tottenham. Max Stake £1. Winnings paid in free bets, valid for 7 days, only deposits with cards/Paypal count. Exchange and multiple bets excluded. T&C’s Apply. 18+|Gamble Aware. As with every major football match we preview, you can bet on this match with the highest odds on the market, selected by our experts among over 70 online bookmakers. Furthermore, bookmakers are offering price boosts on Tottenham vs Man City! Visit our Enhanced odds section! BetAndSkill's professional punters have taken a closer look at this game and try to determine which team is likely to prevail! You can find below our betting tips on Tottenham vs Manchester City! Don't forget you can combine all these betting tips by requesting your own odds. Check out here all the "Request A Bet Bookmakers"! Do you want to read our Premier League free picks? Please visit our Premier League free predictions and this weekend's football accumulator tips sections! "Tottenham vs Man City predictions, betting tips, lineups and odds (Premier League - 14.4.2018)"